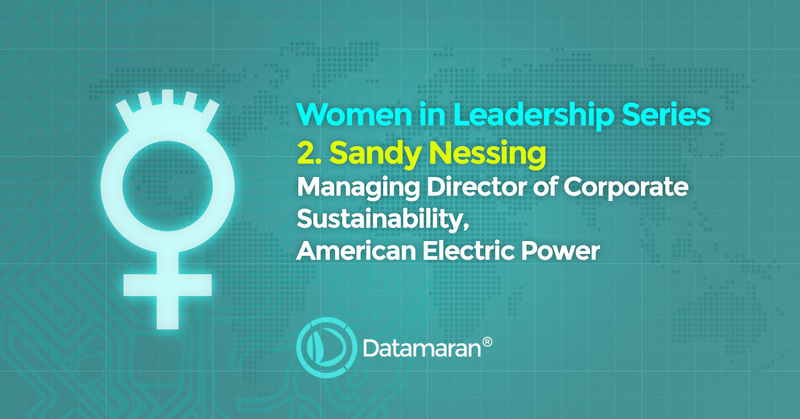 In the second part of the ‘Women in Leadership’ blog we speak with our client, Sandy Nessing, Managing Director of Corporate Sustainability at American Electric Power. Sandy first conducted a materiality assessment in 2012, and reveals AEP’s journey from an initial ‘long and laborious’ process to one that now uses Datamaran’s big data AI technology technology to improve efficiency and quality. Q: What are the Top 3 Challenges You face in Conducting a Robust Materiality Assessment? 1. First and foremost: where to start the process, especially since we’ve done this once before. The first time through was long and laborious; there has to be a way to expedite it but also achieve the same high quality result. 2. Second: resource capacity. During our first assessment, which took six months to complete, there were many long meetings, research, etc. We don’t have the luxury of that time today yet we want to engage many different stakeholders. 3. Third: whose definition of materiality to work toward. This one is especially tricky today, compared to when we first started in 2012. There are many definitions and whatever we land on has to be appropriate for AEP. Q: What are Your Top Tips for Conducting a Robust Materiality Assessment? 1. Cast the net wide when engaging stakeholders, internally and externally. 2. Make sure you have all of your stakeholder groups adequately represented. When we did our first materiality assessment, only one large customer responded to our survey – Walmart – which skewed the results. We made a concerted effort to go back to the manufacturing and industrial base that makes up the larger portion of our commercial and industrial customers. 3. Remember that you may need to make judgement calls when the data comes back. For example, an issue that scored low on the matrix was actually quite important because it had been the subject of a shareholder resolution (which was withdrawn because we agreed to greater transparency around the issue). 4. Take into account externalities that could influence responses. For example, reliability scored off the charts – but that’s because our survey went out on the heels of Hurricane Sandy. Q: How are You Leveraging AI Technology to Facilitate This Process? This is still new to us but we are excited to see how this technology can help us go deeper with respect to really scanning the environment for risks, opportunities, gaps and emerging issues and trends. Q: How Do You See the Materiality Assessment Process Evolving in the Next 5 Years? Thanks to technology and data analytics, I think the era of a materiality assessment being a big project requiring an army of resources will end. We’ll be able to constantly scan the environment to know what our material issues are, how they are changing and to immediately spot new issues or trends. This makes it instantaneous. Technology and data analytics are the key. Q: How Do You Think the Materiality Assessment Process can Support Risk Management Activities? Risk goes hand-in-hand with materiality. If an issue is material to a company, there is inherent risk associated with outcomes – either way. That makes monitoring so important, especially in today’s 24/7 digital world. Things can change on a dime and it’s a process that allows you to stay ahead of the curve. …And now a question for the audience…Are You in Charge of the Materiality Analysis for Your Company? Then we’d like to invite you to have a free copy of our ‘7 Secrets to the Perfect Materiality Analysis’ for all the guidance and secret tips you need. "Data-driven materiality helps us to make better strategic decisions"
"Santander has made inroads in benefiting from new developments incorporating Datamaran at the center of processes in prioritizing sustainability issues”. This book has been written for sustainability professionals, corporate responsibility professionals, risk managers and those involved in corporate reporting. It is designed to give you the key information you need to create the perfect materiality assessment. We’ve seen a multitude of materiality assessments. Conducting the analysis and creating the assessment is a key use case for our Datamaran platform so we’ve learnt best practice from working with our clients. In this eBook we’ll show you the process of identifying, refining, and assessing numerous potential environmental, social and governance issues that could affect your business, and/or your stakeholders, and how you can analyse and condense them into a materiality assessment that informs your organisations strategy, targets, and reporting. “Material information is any information which is reasonably capable of making a difference to the conclusions stakeholders may draw when reviewing related information”. GET THE EBOOK AND UNLEASH YOUR INNER "MATERIALITY MASTER"